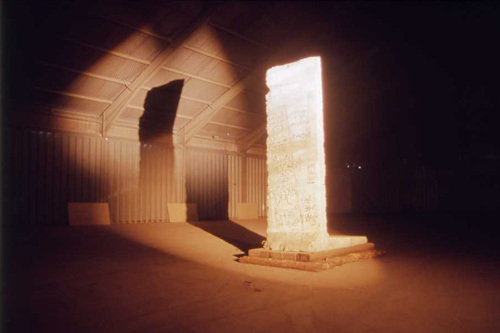 In 1997 ‘A Mighty Blow for Freedom’ saw Another Space place the iconic sculpture by Michael Sandle, at the time Sculpture Professor in the highly influential university in Karlsruhe, in the context of its Vorticist antecedent. The sculpture was placed in full view on a flat bed truck. It toured over 1500 miles around the Highlands of Scotland as part of the Highland Festival where it featured in a commissioned film for BBC Scotland and was supported by the Scottish Arts Council. The exhibition, ‘The Rock Drill and Beyond’, provided a unique opportunity to consider a major piece of twentieth century sculpture, and to examine the historical context and circumstances under which the sculpture was made and subsequently dismantled. This installation allowed the fully reconstructed Rock Drill of 1913, by Jacob Epstein, to be placed in the context of the First World War. The sculpture was exhibited alongside memorabilia, images and artifacts dating from the 1914-1918 War (obtained from museum collections and loaned by members of the public) and was the first showing for the Rock Drill in Scotland, and only the third time the full scale version had been shown in the UK. These sculpture and objects were used to create an installation which linked Epstein’s major work of modernist art with the time of its making. This version of the Rock Drill should not be confused with the truncated bronze version on display in the Tate Gallery in London. 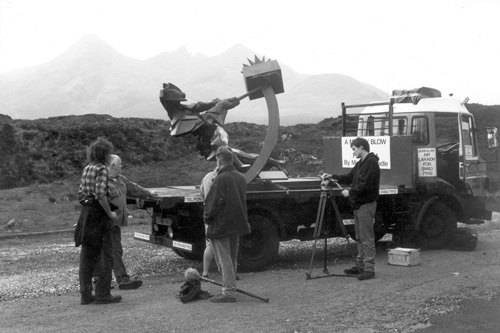 Six contemporary artists from Scotland were also commissioned to produce works influenced by the Rock Drill. Their pieces were placed throughout the exhibition bringing some of the concerns and issues raised by this controversial sculpture into the present day. 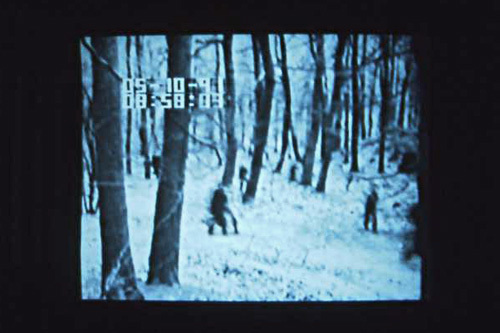 The exhibition was curated by Another Space and exhibited in Inverness Museum and Art Gallery between 16 May and 13 June 1998 and was followed by a tour of galleries in the Scottish Highlands. Text from the catalogue, written by Trevor Avery, was enlarged and mounted in Thomas Hirschhorn’s U-Topia Room as part of the Common Wealth exhibition in Tate Modern in late 2004. “Jacob Epstein’s Rock Drill is strikingly chilling. Artists involved: Another Space, Robert Callender, Gavin Lockhart, Alex Main, Tim Pomeroy, Frank Pottinger, Mary Rosengren. In collaboration with Inverness Museum and Art Gallery, The Highland Festival, Highland Council Cultural and Leisure Services. 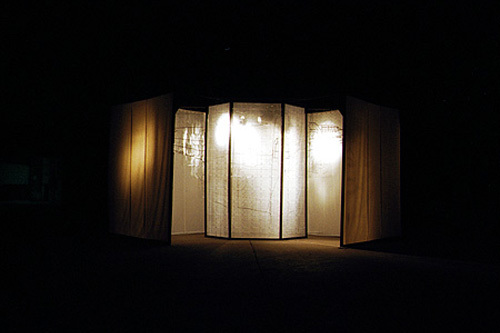 Asylrecht was a multimedia installation comprising of the film ‘Asylrecht’, a section of the Berlin Wall, and detritus from a refugee camp in Serbia. It acted as a comment on The Refugee as a Monument to the Twentieth Century. 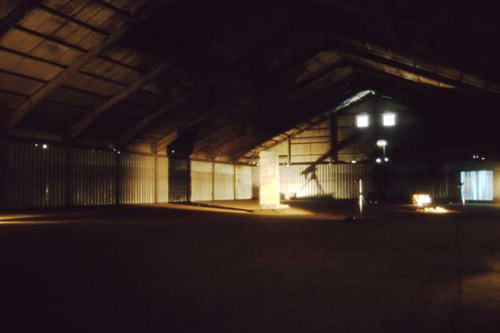 The exhibition was curated and designed by Another Space and exhibited during the summer of 1998 in a large aircraft hangar at Highland Deephaven, a former airfield on the shores of the Cromarty Firth. The film ‘Asylrecht’ was made by in 1948 by Peter Shankland, a Scottish film maker and author. His daughter Cathy lives in the Scottish Highlands, close to the Cromarty Firth, and was the inspiration for the project. In association with the Yorkshire Sculpture Park, The Bundesarchiv, and Transit Film Berlin. Supported by Scottish Arts Council, Ross and Cromarty Enterprise, Highlands and Islands Enterprise, and The Highland Council. 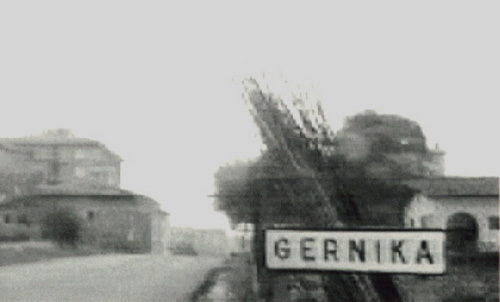 Having been held in Scotland, Eibar and Pamplona, the exhibition moved finally to Gernika-Lumo, the city that inspired Picasso’s ‘Guernica’ and is now archived in the Gernika Museoa: Bakearen Museoa. Artists involved: Another Space, Iñaki Elizalde, Tony Grady, Liz Ogilvie, Andrew Stenhouse, Juan Ugalde, Nelson Villalobo, Una Walker, Jose Luis Zumeta. Supported by Scottish Arts Council, Ross and Cromarty Enterprise, Hi Arts Highlands and Islands Enterprise, Pamplona District Council, Basque Regional Authority, ERDF Objective One, and The Highland Council. Subterranean Landscape Blues was an installation comprising digital film and museological pieces and was based on the history and present day impact of the oil industry and militarism on the Highlands of Scotland, and on the Cromarty Firth in particular. The focus of the film and installation centred on twentieth century military underground oil storage facilities in the hills above Invergordon. These cathedral sized caverns were used to store oil for the British Navy and were connected to the dock at Invergordon by underground pipelines. These were little known and had not been filmed until this project. Subterranean Landscape Blues was a New Media Scotland Commission that premiered at Art.tm in Inverness in 2000. It also exhibited at Glasgow Film Theatre and Belmont Cinema, Aberdeen.